Best taken while suspended upside-down, dangling by a rubber band strapped to your ankles. Begins with intense anxiety. Guaranteed rush to the head follows. Heart continues pumping for at least 30 minutes after. At 43m (142 ft), this jump from yesterday (Kawarau Bridge) was nothing compared to the one I just did a few hours ago, (Nevis Highwire) which comes in at a cool 134m (440 ft) and about 8 seconds of falling from a jump pod suspended by a few cables above the middle of a deep canyon. 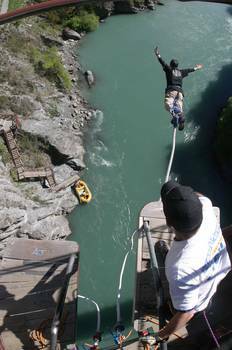 And yes, that’s me in the photo above, executing the stiffest swan dive of the day from the Kawarau (the smaller of the two I’ve done so far). On that jump, I came six inches from hitting the water below… More photos will surely follow.